Aidan's friend, Antonio, came over to decorate cookies. 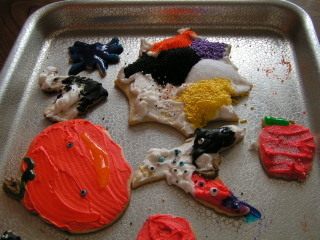 We had bat, pumpkin, witches hat, squirrel, apple, moon, spider, and spider web cookie cutters. 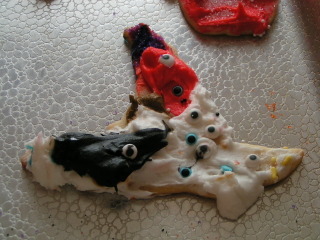 I used Martha Stewart's Signature Sugar Cookie recipe which is very easy and dependable. I added a little lemon extract to it. For frosting, I made a recipe from the AllRecipes archive. It would be fun to ice them sometime but not so fun for kids. I colored using gel coloring. For black, I added the black coloring to store bought chocolate frosting. I learned that tip at a Williams Sonoma cookie/cupcake decorating seminar. 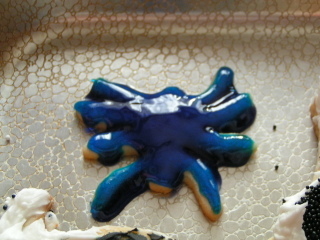 I gave the boys little nut cups with sprinkles, jimmies and sanding sugar to decorate. Both boys did the same thing. 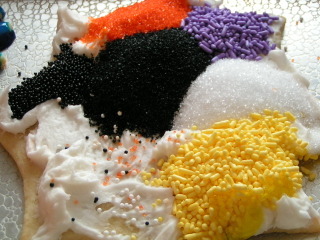 They put all their sprinkles on one big cookie!! The picture above is Aidan's spider web. More cookies after the jump including Aidan's eye hat and a spider he decorated completely with an icing gel pen. How great you all made cookies together. That's the fun of holidays, doing celebratory activities together and just sharing time.